Posted on: March 6th, 2018	by Jennifer A. 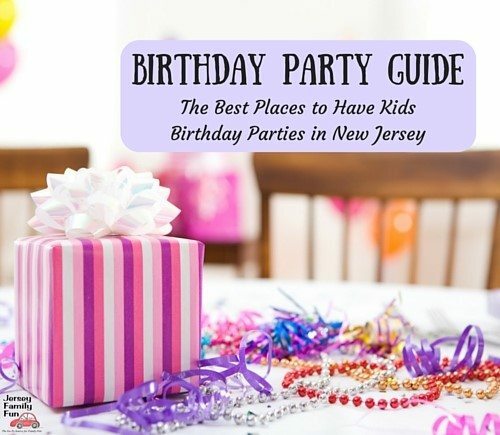 Want a South Jersey beach that offers extra fun for the kids? After indoor fun, head out to the beach. Parents with little ones can even play on the playground side. It’s enclosed by the boardwalk so kids can’t get too close to the water. Or park your towels on the other side for a beach playdate with water fun. When the kids get tired of the beach, finish off your Ventnor day with time on the playground. We promise your kids will be zonked out in the car from all the fresh air and you’ll have a peaceful ride home. 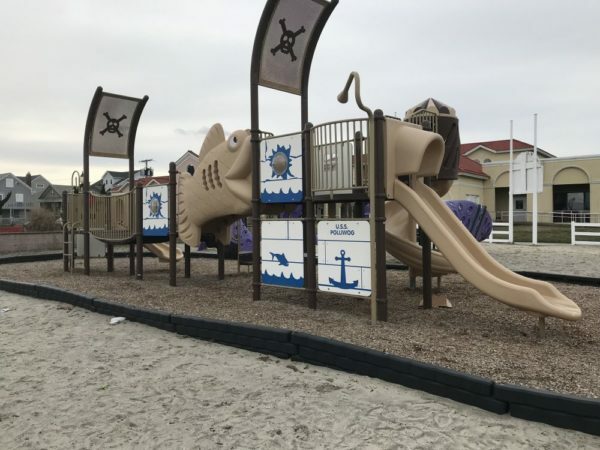 The Sand Castle Park is located at 6500 Atlantic Avenue in Ventnor. Parking for the Sand Castle Park is available in the Ventnor Library parking lot as well as in a side lot and on the street. Most parking was available for free. During the summer months, parking may be harder to find due to summer residents. One of my favorite features of this Ventnor park is this spider web that kids can climb. Get to know Sand Castle Park through our details and pictures below. We did not see any stated hours for the Sand Castle Park in Ventor. We believe like most parks it is open dawn to dusk. 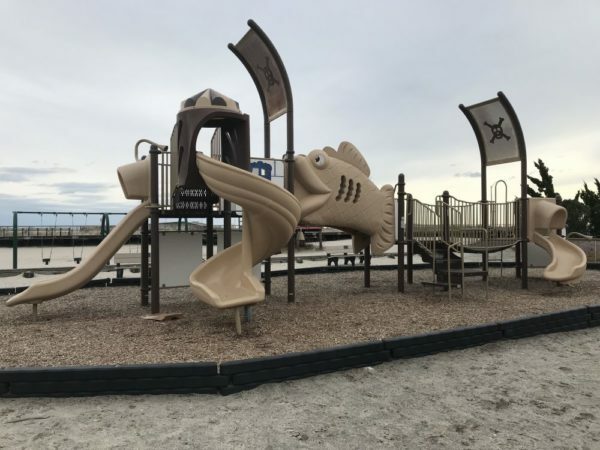 The Sand Castle Park has bathrooms located inside the complex with the Ventnor Library. There were about 7 park benches near the playground and a few more around a fountain. There were no pavillions. Is shade available at the Sand Castle Park? There were no shady areas at the Sand Castle Park in Ventnor. The Sand Castle Park has 1 main playground with multiple play areas. 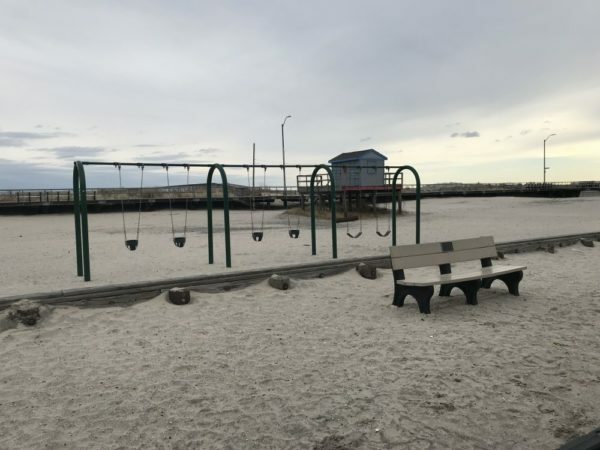 This Ventnor playground is just a few steps before the boardwalk. The ground surface is sand with the boardwalk separating the playground from the beach. 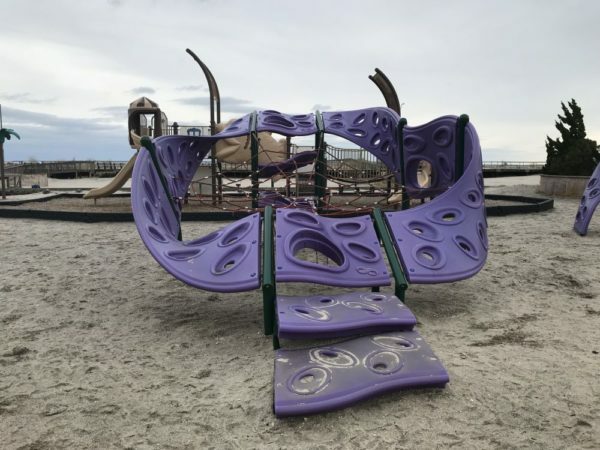 1 Large purple climbing playground structure with a climbable spider web. 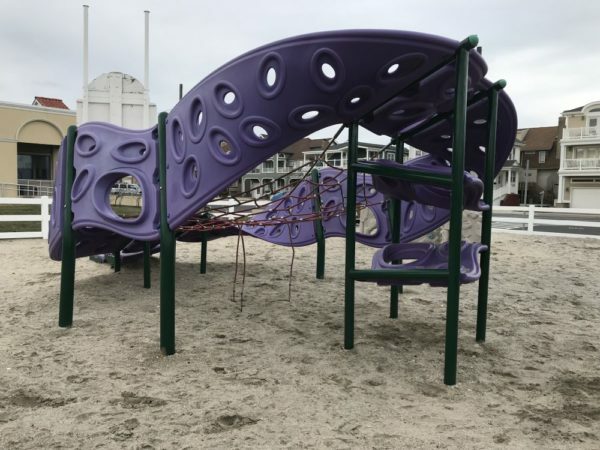 Another large purple climbing playground structure with unique monkey bars. The traditional rock climbing wall. Sand Castle Park has 4 baby swings and 2 traditional swings. A view of the beach side of the pirate ship. Watch our video tour of Sand Castle Park below. Sand Castle Park in Ventnor does not offer any walking trails. However, you can enjoy a nice walk along the boardwalk or in town along Atlantic or Ventnor Avenues. There are no traditional fields at the Sand Castle Park, but there is a large area of sand. Bring a soccer ball, kick ball, or other beachy sports equipment and have a pick up game. 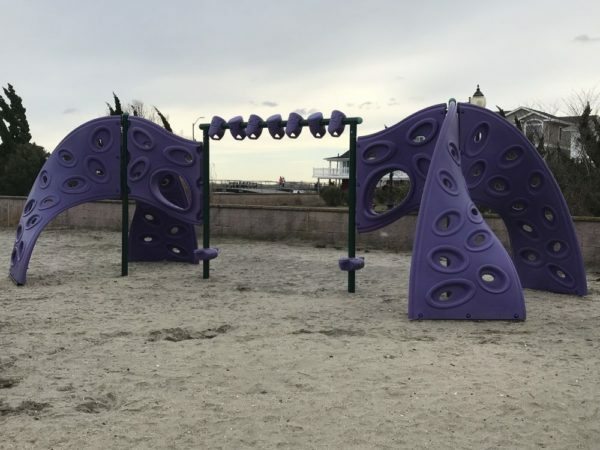 One of the things parents and kids will enjoy most about the Sand Castle Park are the unique climbing structures. Not only can kids climb the traditional rock climbing walls, but the two purple structures add unique climbing challenges. The spider web in the middle adds an extra element of fun and is an instagram-worthy spot. With steps at the front, even the littlest of kids should be able to get inside. This spider web can be climbed up multiple ways. To see more pictures of Sand Castle Park visit this photo album on Facebook in our South Jersey community. 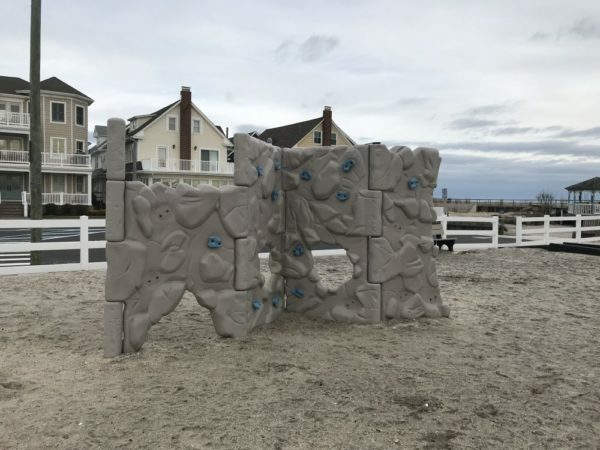 Click over to read more Ventnor parks (coming soon), Atlantic County parks, or New Jersey Parks & Playgrounds.